Klondike. The Life and Death of the Last Great Gold Rush. Toronto: McClelland & Stewart Ltd. Good+ with no dust jacket. 1958. Hardcover. Gift Inscription. .
Toronto: McClelland & Stewart, 1958., 1958. 8vo. pp. viii, 457 [xix], . 1 double-page map and 2 single page maps. illus. on front endleaves. biblio. index. cloth (top slightly sunned). dw. (torn and creased). First Edition.. F. Hardcover. McClelland & Stewart. Hardcover. B001535A8I 1958 McClelland & Stewart Book Club Edition. Significant wear, tear, and rubbing to DJ. Book is in good shape. Text is clean. We are FAST!! Check our feedback! Ships next day in padded envelope with barcoded address, delivery confirmation, and tracking number. . Fair. Toronto: McClelland & Stewart. 1959. Early Printing. Hardcover. Very Good in a Good dust jacket. Several chips and tears to jacket. ; 8vo 8" - 9" tall; On Sale! . Toronto, Ontario, Canada: McClelland and Stewart, 1964. Reprint Edition . Hardcover. Good/Fair. 12mo - over 6¾" - 7¾" tall. Very good black brown cloth. Illustrated endpapers. Fair gold color pictorial DJ. Some wear and tear, lacking large pieces of spine extremities. (1964), (October 1958), 8vo, vi-viii, , 3-437pp. Bibliography pages 446-457. , i-xix, Index, , New archival mylar cover included. SPADONI & DONNELLY 1498 McClelland & Stewart Bibliography, Hoy 4379, "Pierre Berton spent the first twelve years of his life in Dawson City, amid the rusty relics of the gold rush, the mouldering riverboats, the decaying dance halls, the rolling mahogany bars. He was the first to distill the Klondike experience into a single dramatic narrative, coloured by splendid folly and heroic achievement." Toronto, Ont: McClelland & Stewart. Very Good with no dust jacket. 1958. First Edition. Hardcover. 0394432061 . Brown cloth covers with gilt illustration to the cover and titles to the spine. A tightly bound copy with an unmarked text, there is wear to the spine end and corners, with partial staining to the botton page edges. 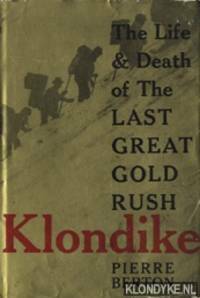 "The Klondike gold rush shook the Yukon on the eve of the twentieth century and stands today as the defining era in the taming of North America and especially Canada's Great North. The history of how a handful of colorful characters sparked the largest mobilization of gold seekers in history is brought vividly to life in this debut graphic novel by the cartoonist Zach Worton." ; Maps; 8.30 X 6 X 1.30 inches; 457 pages . McClelland & Stewart, January 1958. Hardcover. Acceptable.